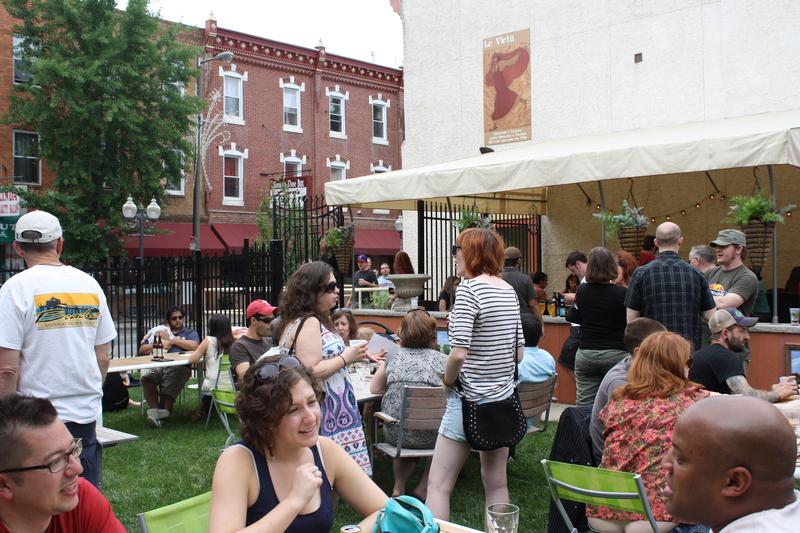 Although we did not get to visit as many Philly Beer Week events as we would have liked to, one of our highlights of the week was the East Passyunk Avenue Craft Beer Fest. 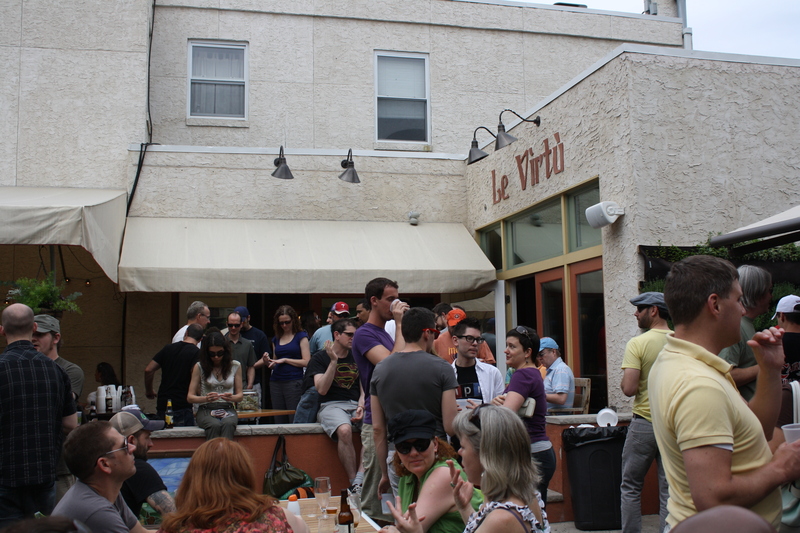 After my husband returned from the Bike Race, we made our way west on Passyunk to our first stop–the beer garden at Le Virtu. My husband and I love everything about Le Virtu and one of our very favorite things to do is to stroll down there on a weekend evening and have dirty martinis (Belvedere for him, Tanqueray for him) with a side of arancini. 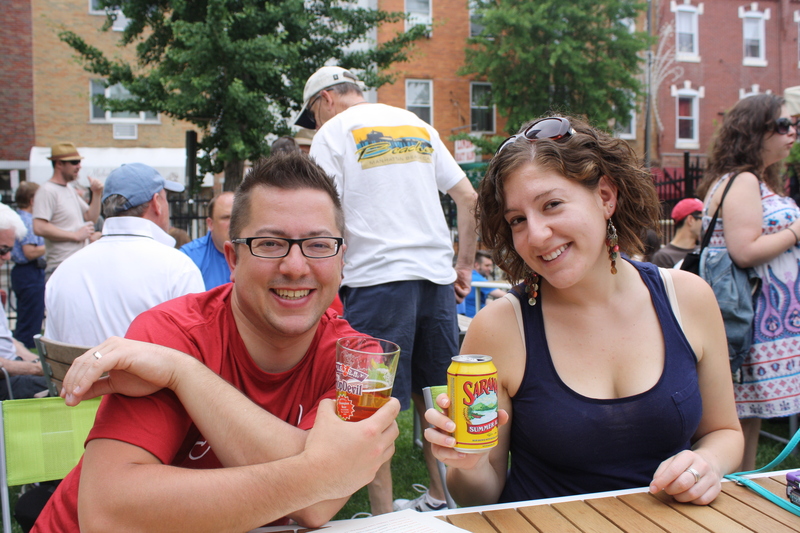 We were excited to check out their outdoor garden, taste some Victory, Troegs, Innis & Gunn, Saranac and Riverhorse and have $5 tastes of their Abruzzese fare. When we got there, the place was popping. 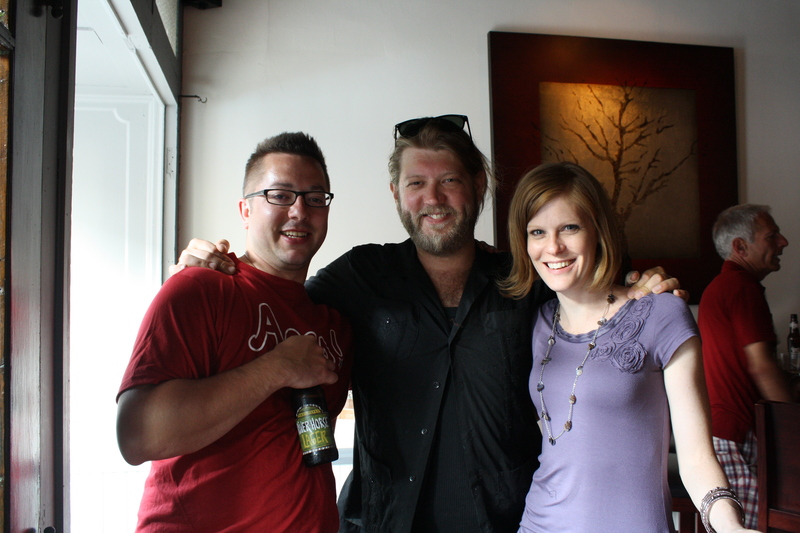 My husband hopped in line for some beer while I spotted two friends and grabbed a seat at the table with them. 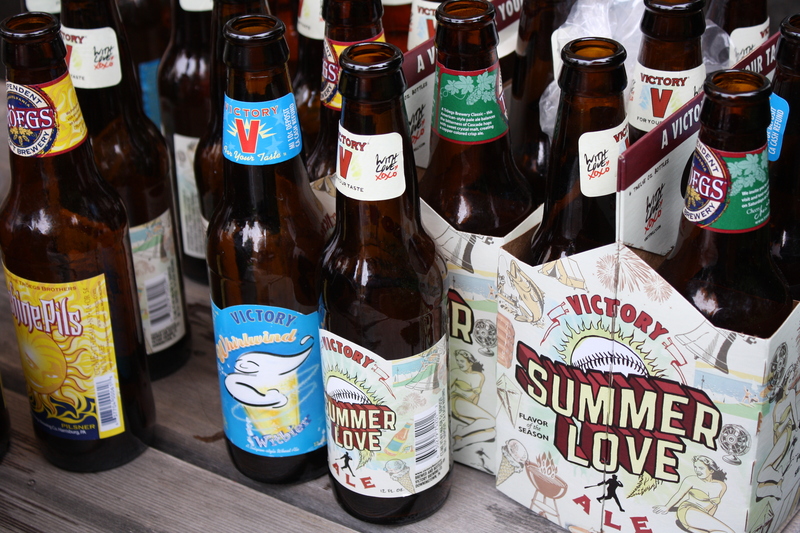 I decided to check out a few of the beers. 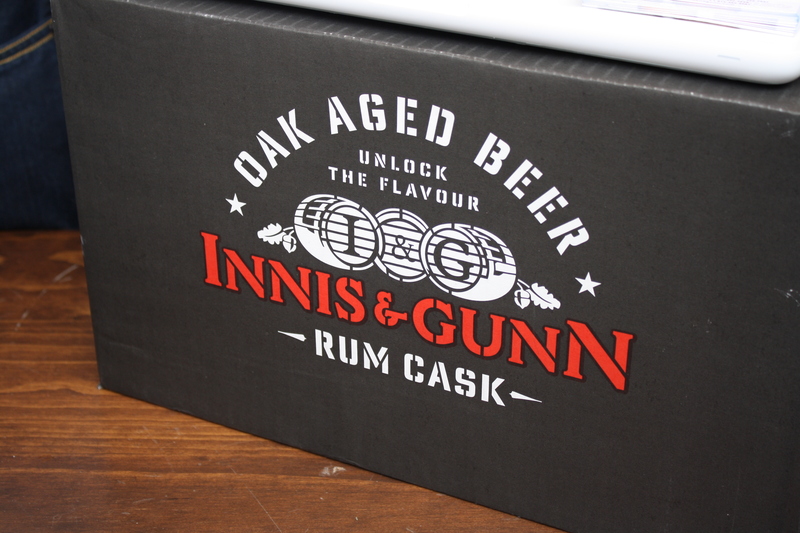 My friends were especially excited for me to sample the Innis & Gunn Oak Aged Beer. 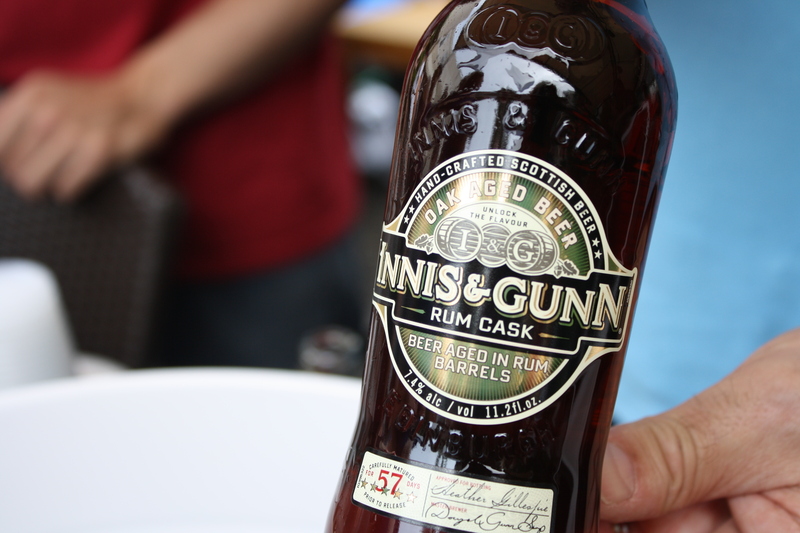 I tried the original and the one aged in a rum cask. You could definitely tell. After we had a few tastes of beer, we decided to order some $5 snacks from the owner, Catherine Lee, who was acting as waitress for the day. 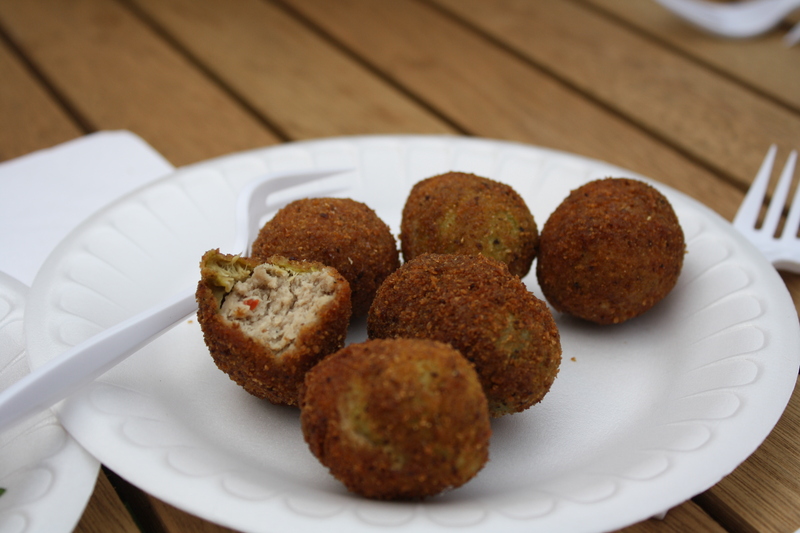 We went with the fried olives stuffed with porchetta and sausage with polenta. 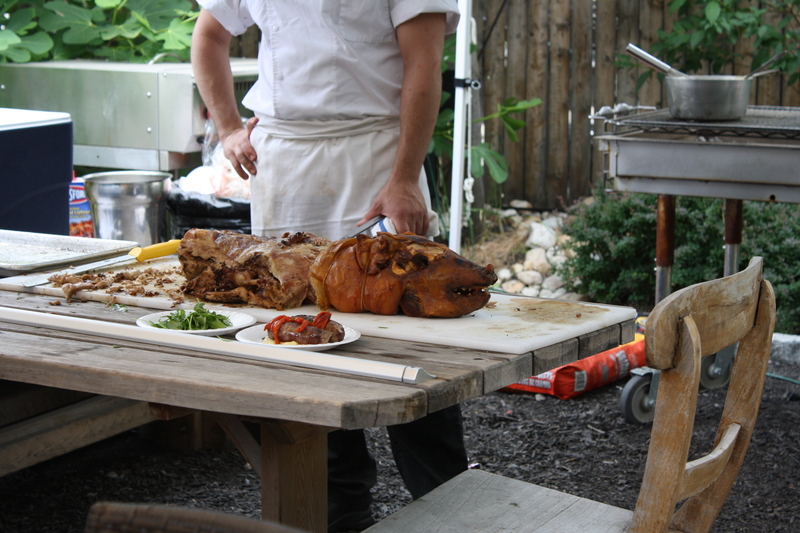 Meanwhile, Chef Joe Cicala was serving up pieces of roasted pig. The food was delicious, as usual. I hadn’t tried the olives before but my mother had them about three years ago and still raves about them. She was right. For my olive-phobic readers, have no fear. This has only a very subtle olive flavor. You mostly taste the pork and fried goodness! 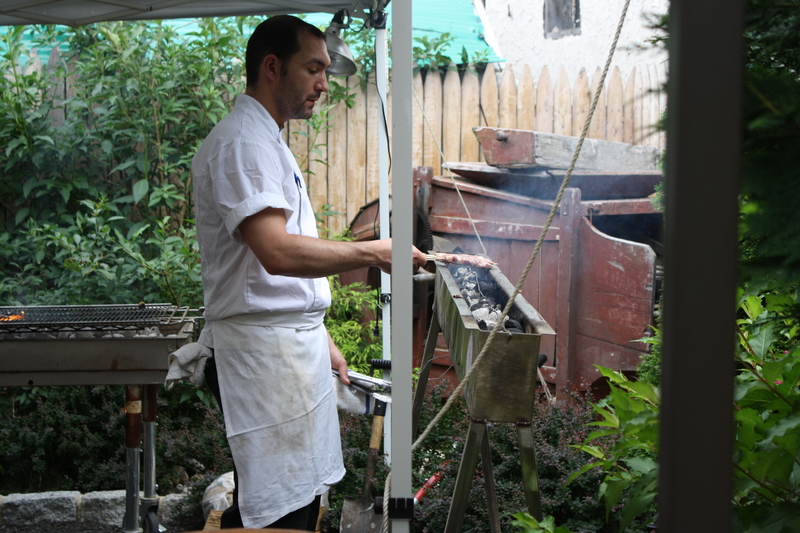 The sausage was simple yet bursting with grilled flavor. 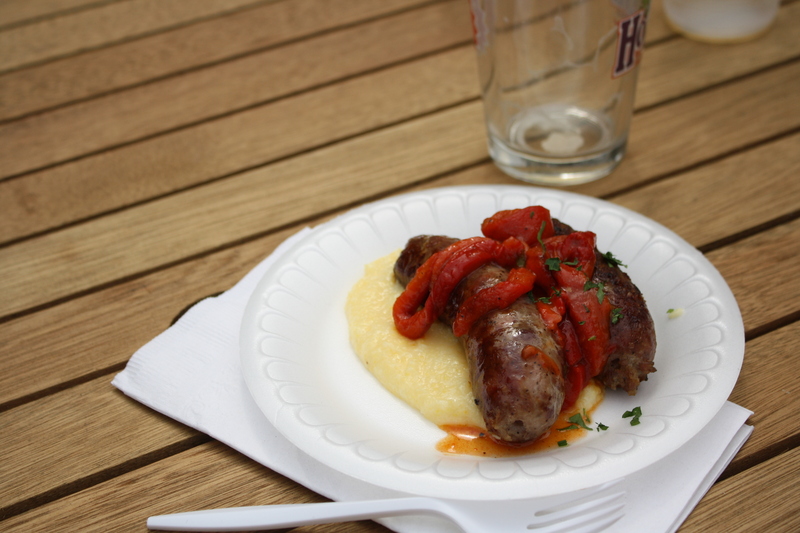 I loved sopping up the polenta and getting a little bit of everything in each bite. My only complaint is that we didn’t order enough. My friend, Heather, and my husband enjoying themselves in the sun. 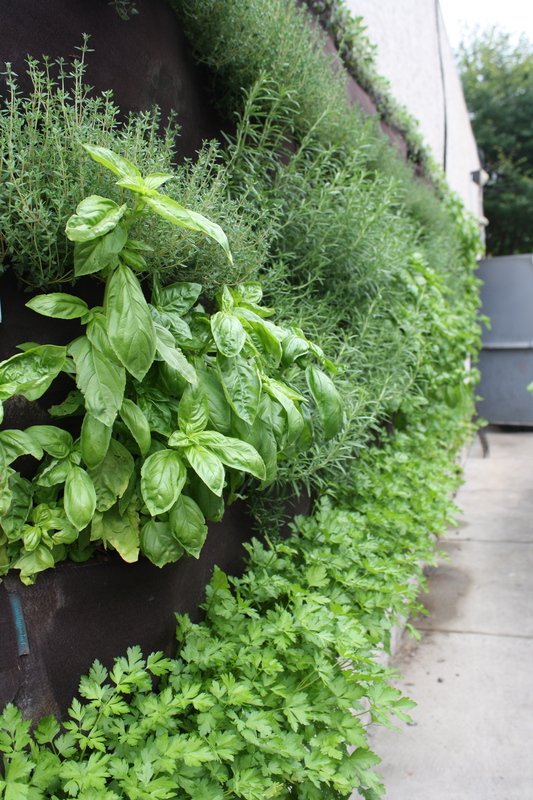 After I ate, I spent some time exploring Le Virtu’s garden. 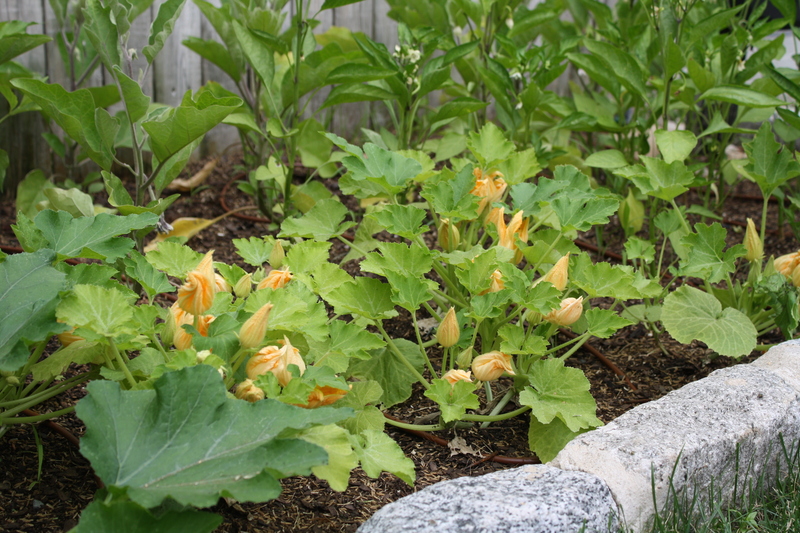 Check out these zucchini blossoms! 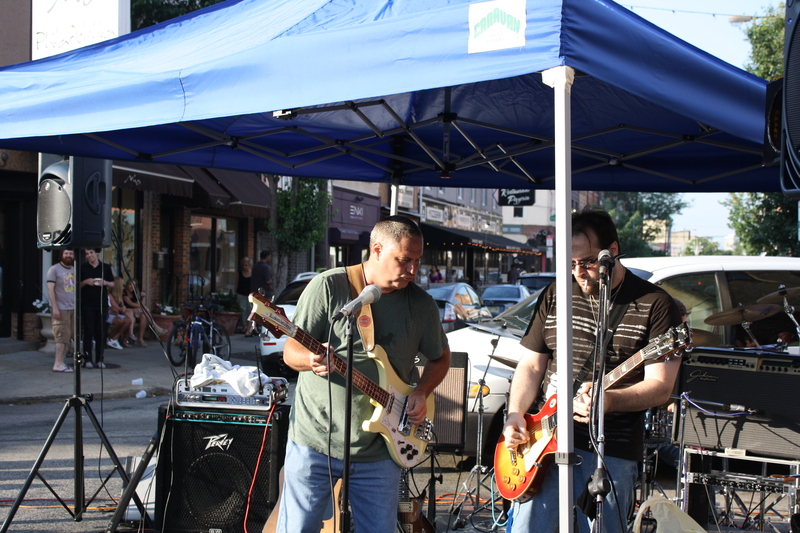 I had to run out to a graduation party for a bit and met my friends at Stogie Joe’s about 90 minutes later. 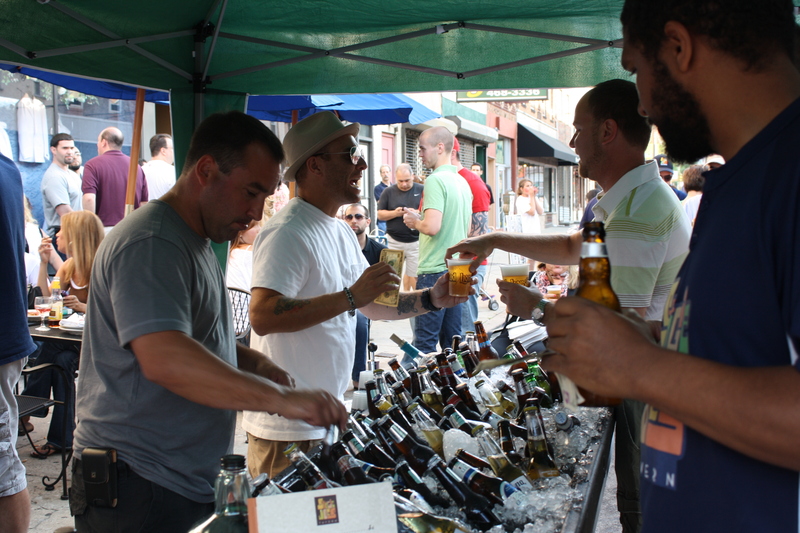 Stogie Joe’s was concurrently celebrating the Craft Beer Fest and the Italian Fest on Passyunk Avenue. Thus the craft beer served inside and piss beer served outside. 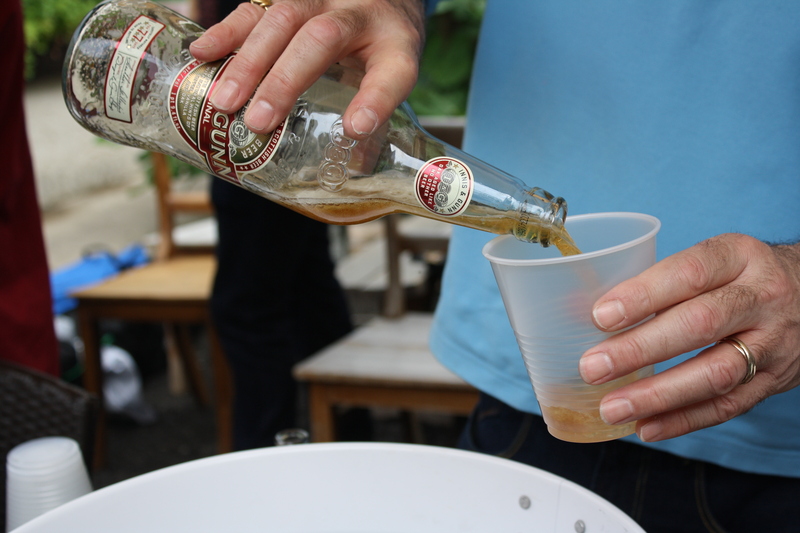 They were running a special of a bucket of five Riverhorse beers for $20. By the time I got there, however, they were out of Riverhorse and were allowing you to make your own bucket–they even let my husband sneak a Chimay in there! Stogie Joe’s was packed–there was a band playing right outside. 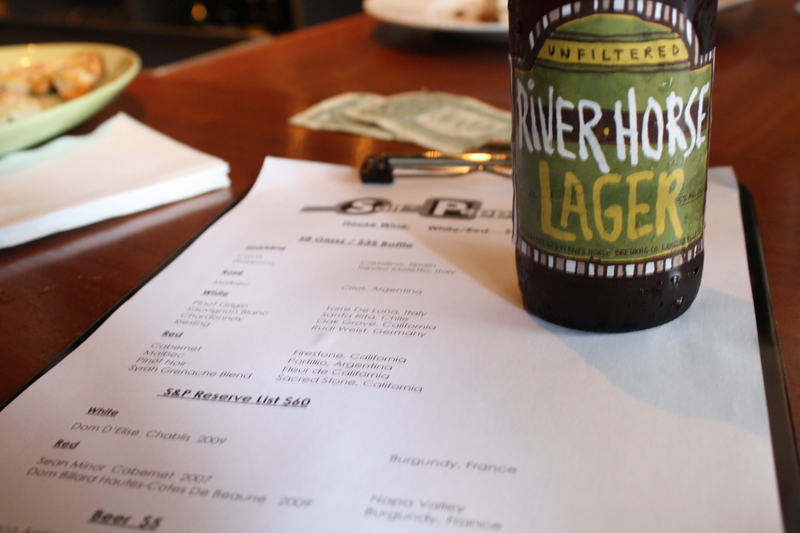 Our last stop was Salt & Pepper’s meet the brewer happy hour with Riverhorse. I was pumped to try some Riverhorse since Stogie Joe’s had run out. Unfortunately, Salt & Pepper was down to their last bottle as well. 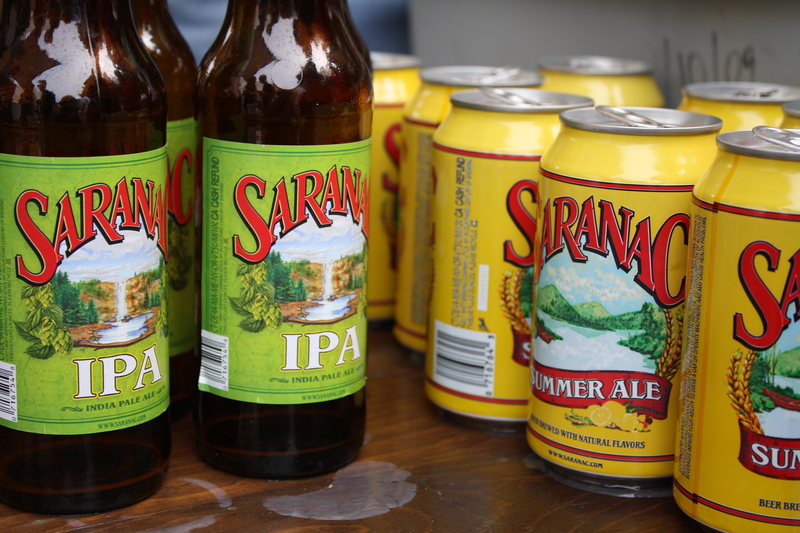 I let my husband have it and I got an Ithaca Apricot Wheat. That was yummy too. 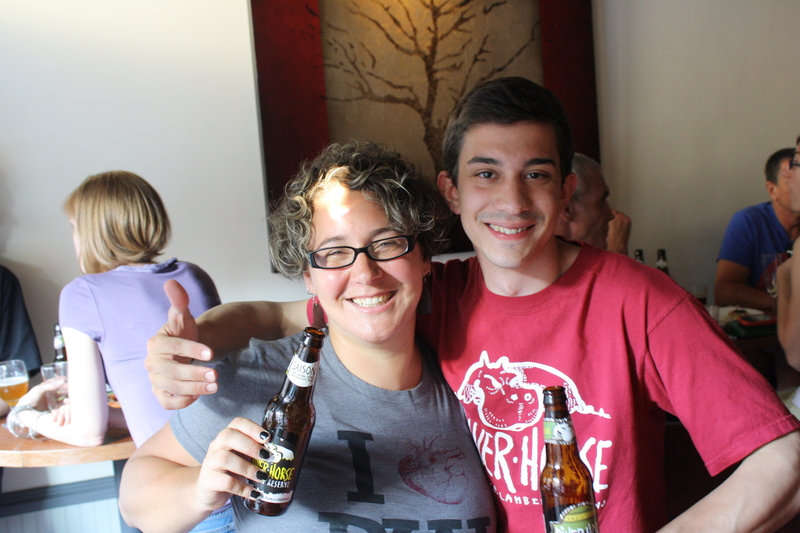 We did get a chance to chat with one of the Riverhorse reps.
Then we ran into a friend and finished our beers with her and Robert Reilly, one of the owners. And then, after that jam-packed day, I went home and went to bed!